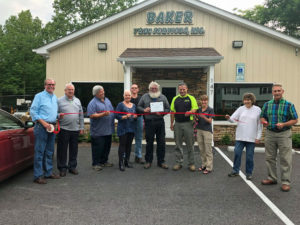 Since 2003, Baker Tree Services has operated out of Lewistown, but they recently relocated to 147 Water Street in Thurmont and celebrated their grand re-opening at their new home. She and her husband, Glen “Eric” Baker, originally started as landscapers, but they started working exclusively with trees in 2003. “It has more profit, and we liked the work better,” said Carolyn. Baker Tree Services can do tree removal, tree pruning, stump grinding, and lot clearing. The work is done by trained experts. Eric is a Maryland Tree Expert, an ISA Certified Arborist, and holds the CTSP (Certified Tree Care Safety Professional) certification. Additional employees are licensed as well. Carolyn says their employees are professionals who take pride in their work and do a great clean-up of their work sites. The crews follow American National Standards Institute (ANSI) standards practices for proper pruning, which insures that only proper cuts will be made. Baker Tree Services employs eighteen people and runs three to five crews, depending on the need. They work primarily in Frederick County but will also go into any of the surrounding counties if needed. On Wednesday, June 6, 2018, the Town of Thurmont held a ribbon-cutting ceremony for Baker Tree Services, Inc. to welcome Carolyn and Eric Baker to the Thurmont business community. They can be reached at 800-383-4595 or treecare@bakertreeservices.com. Check out their advertisement on page 19. The Town of Thurmont welcomes Baker Tree Services, Inc. to its new location on 147 Water Street in Thurmont with a ribbon-cutting ceremony on June 6, 2018. Owners, Carolyn and Eric Baker are pictured next to Thurmont Mayor John Kinnaird (holding the certificate) to his left.